Estimating how often the game should take eight digits to solve — let me call it the Suspenseful case — struck me as practically impossible to do by reason alone. Some little problems, like working out the probability of sweeping the piggy bank or mid-range prize or the car, are certainly doable and might make decent Intro to Probability questions. But it seemed to me there are so many ways to select seven digits out of ten without getting a prize that I’d become trapped in the labyrinth of subcases trying to work that out. With reasoning out as being too much work, empirical estimates start looking good. We could watch The Price Is Right an awful lot, pay attention each time “Any Number” comes up, and count how many digits it takes to win a prize. I suspect we’d probably need a couple hundred rounds to get anything a little bit plausible; if “Any Number” is played one or two times a week, then, that’s a couple seasons of watching before we can say something. I don’t actually know that it’s played one or two times a week; that just feels like about how often it turns up, and I know what I just said about impressions. But it’s a popular game, it doesn’t require any complicated props, and it seems (again with the unexamined impressions) to take about the same amount of time to play each game, so it should be very attractive to the people who schedule the show’s games. So my friend has a perfectly good reason to think the game takes to the last digit “all the time”: it actually does, three times out of ten. It takes to the 7th or 8th digit about three-fifths of the time, which is probably why the game seems to take such a steady amount of screen time. It also suggests the game really does naturally tend towards the Suspenseful case, which might be part of what makes it popular among viewers. Now, some weaknesses to this: this little model assumes that contestants are guessing randomly, that the contestant has absolutely no idea what numbers might possibly go where. A dedicated Price Is Right fan will probably say this is perfectly correct, based on the number of people who can’t get the hang of “Clock Game”, and who haven’t noticed how to crack “Cliffhangers”. (I won’t spoil it, but if you’re figuring to be on the show, wouldn’t you look for tips on the games that you can strategize for?) But there’s no actual guarantee that contestants are guessing randomly. A sharp contestant would be able to make fairly good guesses about what the car’s prices are, and throw these percentages off. Of course, it’d take a long round of watching the show and counting the results to tell whether contestants were, on average, better or worse than random chance. You can try counting. I know I’m coming to the party three years late, but for what it’s worth I agree with your friend that this game seems to end with one digit missing in each price more often than not. Did you need to include in your calculation the second 1 or 2 that is available to be chosen? Not to worry; stuff stays on the Internet forever, until you fall into a fit of self-doubt and start deleting stuff. There’s not a need to include the second 1 or 2 in the prices (the ten-thousands digits in the price of the car); that digit is always revealed to the contestant before digit-calling begins. If I remember rightly, I didn’t simulate this by generating random prices and simulating contestants picking numbers at random. I instead had the program pick, at random, which of the ten concealed digits the contestant matched first, then which of the remaining nine the contestant matches next, and so on. They’ve won something somewhere between the third and the eighth matched digits; it’s just a question which of the three prizes they did. Ah yeah! I did see that. (Well, heard it; I usually leave the TV on in the other room and listen.) But I’m easy on the show’s writers. There’s an art to doing a proper Showcase Segue and sooner or later everything gets caught in it. Simply stated: There is a very strong bias towards placing the HIGHEST of the 3 Piggy Bank #s in the FIRST slot — for example, if 1-6-9 are the Piggy Bank #s, then the Piggy Bank will be either 961 or 916. OVER 5 SEASONS (37-41) , THIS RULE WORKED 80.3 % OF THE TIME (118/147) VERSUS AN EXPECTATION OF 33.3 %. ALSO, OVER THOSE SAME 5 SEASONS, “0”, AND “1” HAVE — NEVER– APPEARED IN THE FIRST PIGGY BANK SLOT. “2” ONLY 5 TIMES. SO……5 instances out of 147 (3.4 %) when the expectation would be 44 instances (30 % of 147) for those 3 digits. Game theory implications : If a mid or lowish # like 6 appears in the 1st Piggy Bank square, there’s a good chance the contestant has a deep reservoir of “safe” non- Piggy Bank #s to call i.e. 7,8,9 . Also, if the final 2 slots of the Piggy Bank are filled , as in “blank-6-8” and 3 numbers remain uncalled (say 0,1, and 5) IT BECOMES ALMOST IMPERATIVE TO CALL “5”. The reason is fairly obvious, I think. A contestant uncovering the Piggy Bank “wins” that amount — of course, in reality they’ve just lost the 2 bigger prizes. 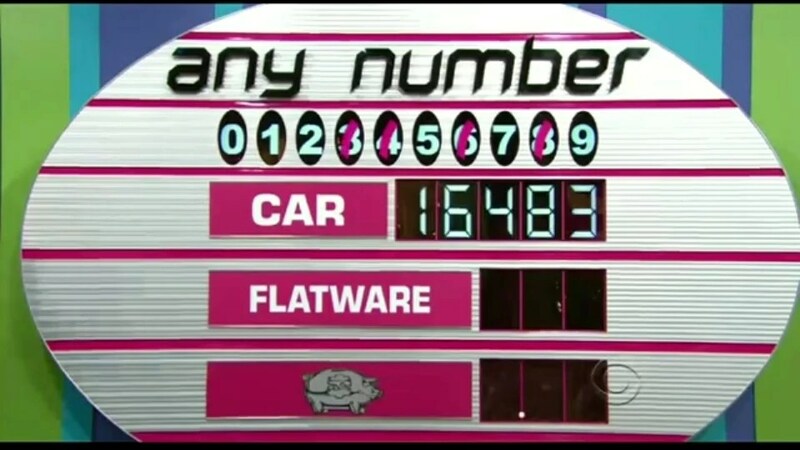 The show producers do not want to appear particularly cheap — giving the contestant $2.57 when $7.52 was possible with the same digits— so, they clearly decided long ago to give a ” higher” amount with the 3 Piggy Bank digits. A sensible decision ………. You are right! This is an important consideration to anyone playing the game. The show runners don’t want the game to be too obviously unsporting, and as you say, $7.52 is a less-awful losing prize than $2.57. So it should help people who’re trying to figure out which of the likely car price digits to call next. Next Next post: Where Do Negative Numbers Come From?